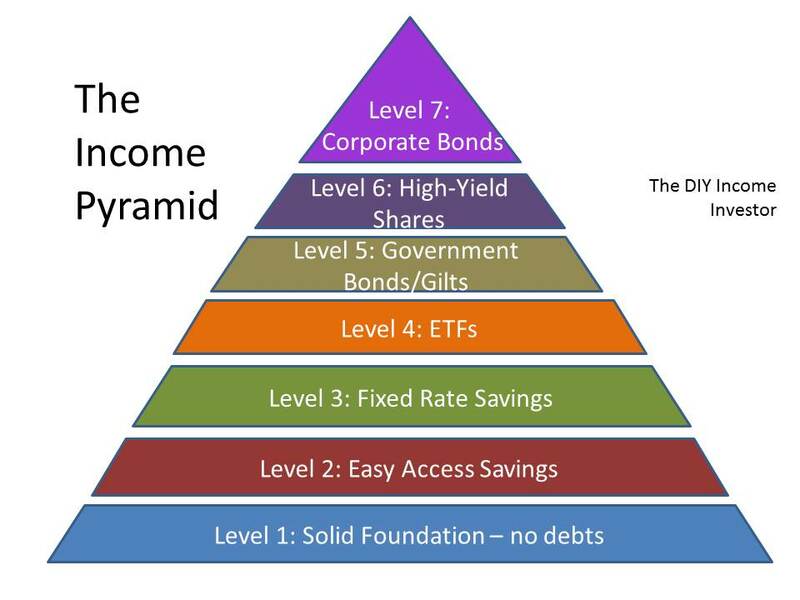 Developing the theme of the The DIY Income Investor, we carry on building up your Income Pyramid by moving to Level 5 - buying government bonds (or 'gilts' as they are known in the UK), preferably within a tax-shielded Internet brokerage account. 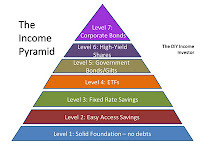 There are also 'inflation-linked' government bonds, such as UK index-linked gilts (or 'linkers') and Treasury Inflation-Protected Securities (TIPS) - but these are more complex to understand and are outside the scope of the simple DIY Income Investor approach. The DIY Income Investor approach is based on minimising risks (as far as possible) - so we suggest you do not engage in currency speculation - buy government bonds in your own currency (this will usually means bonds issued by your home government or local authorities). Government bonds are about as safe as you can get (but see below...). Gilts are the crème de la crème of low risk investments. Backed by the British government, no other investment offers a more watertight guarantee. Despite being 'safe' government bonds can sometimes offer competitive returns to cash - the current yield on some UK government stock is comparable with what is offered in some (time-limited) savings accounts. However, with a government bond, the yield you buy at is the yield you keep for the life of the investment - so there is an important element of stability in the income stream. However, inflation can affect the 'real' value of this income - so returns that look good today may not look so fantastic in two years' time. If you buy now, and have to sell them off early, the market price could be substantially lower at that point. Government bonds are issued at par (i.e. their face value), but are then traded on the open market. This means you can sell the bond before its redemption date, in which case you might not recoup your initial investment. But it also means that you can buy bonds below par and hold them till redemption to make a profit (or, of course, buy them above par and actually make a capital loss!). The coupon offered by a government bond will depend on a number of factors, including the prevailing interest rate, inflation expectations and how sound the government is perceived to be. Riskier governments have to pay more; solid ones pay less. The amount also varies according to prevailing bank interest rates, the date on which the bond issue matures and investor demand (particularly of institutional investors). Gilt prices rise when the national reserve bank (in the UK, the Bank of England) cuts the base interest rate, and fall when the base rate goes up - so government bond yields rise and fall with interest rates. Government bond prices are also affected by the market's perception of future interest rates, and this is reflected in the yield curve (see below). The longer a gilt has to maturity, the more sensitive it is to changes in interest rates – something known as duration risk. One of the great attractions of bonds is that you can 'lock in' a high yield that will be maintained no matter how far general interest rates may subsequently fall. Another attraction is that - in the UK at least - you can buy relatively small loads of gilts (whereas Corporate Bonds often have to be bought in quite minimum quantities). How risky are government bonds? Government bonds are one of the safest assets classes, as they are guaranteed by the government; defaults are rare, although they have happened, particularly with city government bonds in the US. In one sense, bonds (including government bonds and commercial bonds) are usually a more reliable source of income than, say, dividend shares, because the initial outlay is (almost always) repaid and the coupon or interest is fixed from the start - so you know pretty well what you will be getting. The other side of the deal is that you are unlikely to make any capital gain or loss if you hold to redemption. The price at which bonds are traded varies according to the market's views on inflation, interest rates, the economy and the company itself. When the market is worried about inflation, rising interest rates or the company doing badly, the price of that company's bonds will fall. How do I buy a government bond? You will need a brokerage account (preferably tax-exempt or tax-shielded) - most accounts deal in most government bonds, although you should obviously check which are included before you sign up. In the UK, you can buy government bonds without a broker - but you won't be able to put these into an ISA (to receive the interest tax-free). When you buy, you will have to also pay for the accumulated (but not yet paid) coupon - so it could cost you a bit more than you expect. How do I know which government bond to buy? how long you want to hold the bond (e.g. 'perpetual' or dated)? your expectation of future inflation - and will the rate of return keep up with inflation? It is useful to understand the concept of the government bond 'yield curve', which is simply a graph plotting the relationship between bond yields and their maturity dates. In the UK there is also a class of 'undated' gilts - called 'perpetuals' (see below). As the bonds are traded daily, the shape of the yield curve changes in line with current prices. As government bonds have virtually no default risk (unlike corporate bonds), their prices (and thus yields) are determined by supply and demand factors, as well as by expectations of inflation and interest rates. So the shape of the yield curve at any moment is, therefore, a function of supply and demand characteristics at different bond maturities. The Redemption Yield is the return implicit in the current market price of the bond, assuming that it is held to its redemption and that all interest payments are reinvested back into the bond. It also includes the capital gain, or loss, from holding the gilt until maturity, depending on whether you purchased the gilt at a price below, or above, par (the 'face value' of the bond and the amount that you will get back at redemption). The Redemption Yield is the standard measure used in bond markets for comparing rates of return on investments with the same maturity. The 'perpetual' offer a better return because of the uncertainty of the market price when you come to sell - if you have to. One strategy is to treat them as a permanent slice of income - it won't increase, but it won't fall (although inflation will gradually eat the value away).